OKAY IF YOU DO NOT WANT ANY SPOILERS for Divergent...STOP RIGHT HERE. Yes, I did go see Divergent today! I had to see it for myself before all the buzz starts hitting the net because there is no doubt, I will accidentally see something...just like I know what happens to Tris even though I haven't read book 2 or 3 yet! Ahhhhh..okay back to the movie. I must say going in that I wasn't sure about Shailene Woodley playing Tris. She just didn't look tough enough, and I'm not that familiar with her as an actress, but I think she did a fantastic job! Great pick casting director. Loved Theo James as Four and thought he and Shailene had believable chemistry. I have to laugh because most of the other characters are quite different in the movie than how I pictured them from reading the book. Though different, I do think Ashley Judd was a great mom and I enjoyed Maggie Q as Tori. I was excited to see the zip line scene from the building and it was everything and more. The scene was drawn out to build the adrenaline as Tris would have felt-I think I even held my breath. Not only did it give you a feel for flying, it also presented a birds-eye perspective of what the once-great City of Chicago had become. Another one of my favorite scenes from the book is when Tris almost falls from the old ferris wheel. The movie cuts this one short with her never in danger. They climb up, get their view of the enemy flag and next thing you know they are on the hunt for it. I thought this was a great moment for Tris and Four to move forward in their relationship in the book, so I was a little sad not to see it here. No butterknife either...in fact Peter is barely a character. They did alter several things in the movie which they often have to do to make everything fit-like the mockingjay pin coming from Prim. Tris doesn't see her mom Natalie on visiting day. Tris and the initiates are working, and her mom has taken a risk to try to find her so that she can inform her of the danger she's in for being Divergent. I don't want to spoil anything more in case some of you are still reading that haven't seen it yet! Now, obviously, you can only show so much in a movie and the director did a good job to include most of the action scenes that people want to, or expect to see so that was great. That said, they did not go deep into building the relationships that Roth built in her books. It was a true struggle that weighed on Beatrice when she had to choose Dauntless or her family, but you don't feel how much in the movie. The relationship with Al is hardly touched, so the intensity when he is involved in the group that threatens to throw her over the railing, you wouldn't get that if you had not read the book. And then of course, how big of a deal it really is when she won't forgive him and he commits suicide. You know Will is her friend, but they are written to be much closer in their small group in the book. Overall, I really loved the movie! I had intentionally waited to read Insurgent until after I saw it, so now it's time for me to go! p.s. if you enjoyed this blog, please click the +1 button just below here so that others may enjoy it, too! Just got home from this and I loved it! And this is a great review Ginger! I do have to say that I liked Tris. For me, she was different than other female leads I could have expected and I enjoyed that. The movie was a good one for me overall and kept me going the whole way through....fun night!! 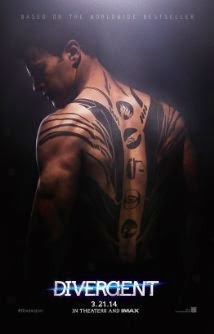 And I agree-on to Insurgent! !